No model for this exercise I had to resort to the live online resource . I worked on an A1 support with charcoal stick. I found it difficult to get the right marks to describe the range of tones that I wanted and instead seemed to get smudges and marks where I didn’t want them. Using an erasure on her hair helped to describe some lighter tones. I feel pleased that I have managed to achieve the twist in her torso and feel that the overall proportions are correct, although maybe the head is slightly too large. I didn’t worry about facial features for this exercise but tried to think about the underlying structures and the interesting angles of her body. This time I used chalk sticks on a black A3 support . I am not at all sure how I feel about the results, in one way I like the roughness and texture of the chalk and in another way the brown outlines are too harsh. The image seems more about form than what lies underneath, maybe because the chunky chalks make it difficult to describe detail. 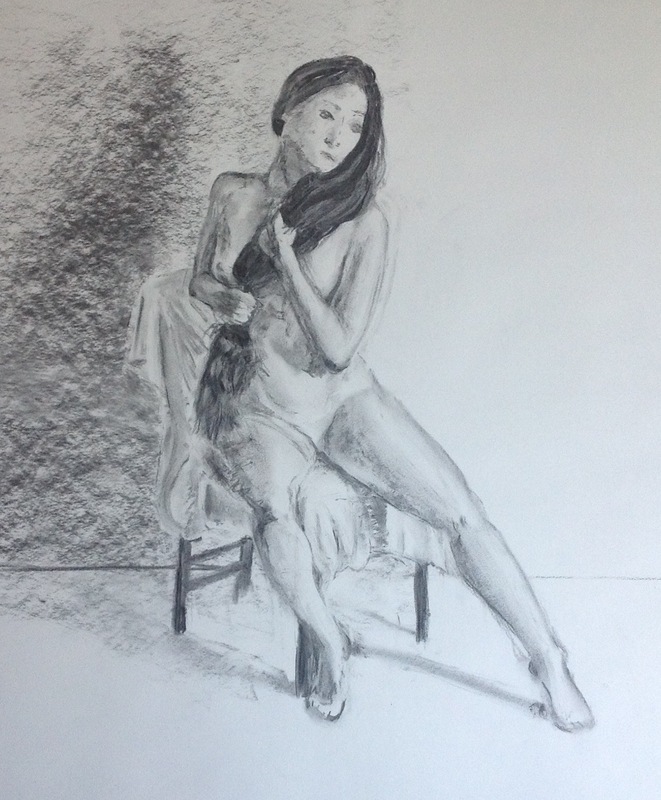 I think I have the proportions and the outer leg appears nearer to the viewer as it is larger.Also I feel I have achieved a sense of weight of the models head resting on the stool. I don’t think I have managed to describe the tonal contrast as well. Here I worked on an A1 support with brown ink dip pen and brush and conte stick for the background. I started with broad sweeps of ink with a mop brush to place the head spine and limbs. Unfortunately my initial marks were out but I don’t mind them. I then alternated between dip pen and brush building up the form and tone of the model. l’m not sure that I have convincingly described the model’s balance of weight and I had trouble with the left foot’s proportions and had to adjust these later. By putting in the background colour it helped me see the model’s form more easily but also helps to excentuate the tonal highlights. I also found it helpful to look at the areas of negative space when drawing the arms. Overall, this is my favourite of the 3 drawings, I feel my marks are looser and more interesting and I like the contrast of media. All three great drawings and I love the colour in the second and third drawings. Thank you for your lovely comments. I’m struggling with final assignments too. 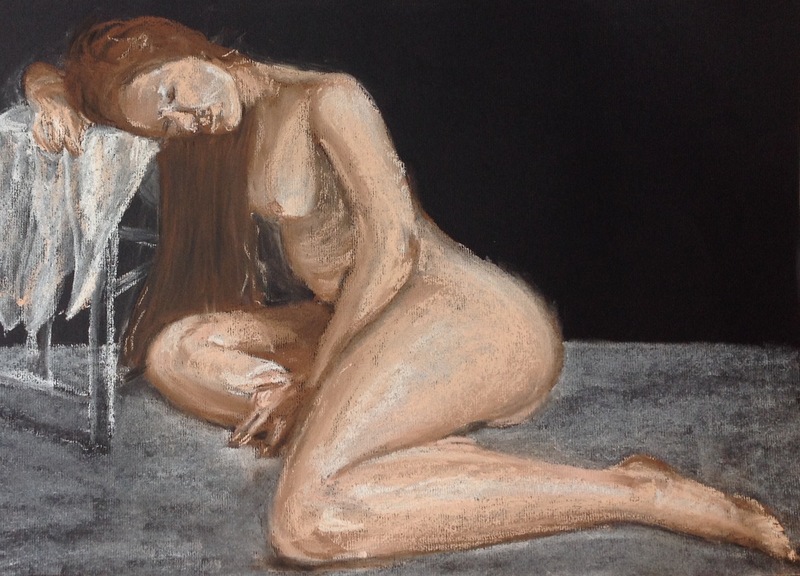 I haven’t yet decided how to approach them but am ordering some larger coloured pastel paper for one of the figure study’s…so much to think about. Good luck! I like all three – but there’s something about the darkness of the hatching against the smooth skin that has created a real dynamic for the standing pose. Really interesting. Like it a lot.